This set of 5 lined, and 5 matching unlined templates will add a little pizzazz to your SMARTBoard files! Simply open one of these templates in Smart Notebook, and you are ready to add your content. The lined templates are perfect for writing a morning message using the pen tool. They can also be used for spelling, handwriting, word work, mini-lesson anchor charts, or shared writing on the SMART Board. The unlined templates are great if you want to type in your own content, or for other times you don’t want lines, such as when students are solving story problems. **Hint**If you add each page to the "My Content" section of the gallery, you can pull one out anytime you have Smart Notebook open, and have a cute and colorful page to write on! You can also then clone the page if you want a multi-page file with the same themed background. Check out my other sets of SMARTBoard templates. **This is a SMARTBoard file. You must have Smart Notebook or compatible software to use this file. 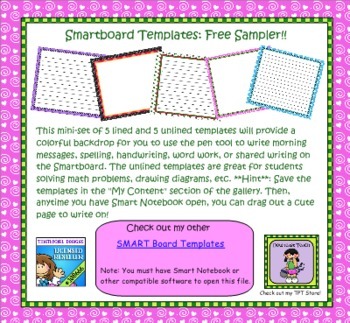 Please follow me to hear about other SMARTBoard products!